Betel House in Hexham is a special place. I recently revisited the site and met with Sir Peter Vardy, and David and Brenda Cox, who run Betel House in Hexham. The site is part of Betel UK, an independent charity (not funded by the state) for people affected by the hardships that lead to social exclusion, long term unemployment, homelessness, and addiction. The Hexham site provides a tried and tested model of recovery and retraining in a safe, structured, family-like environment with consistent peer-support. Residents are encouraged to aspire to a new and healthier lifestyle and learn character-building principles at home, and through work, to enable them to build a stable and drug/alcohol-free future for themselves. 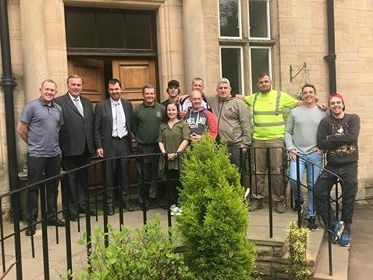 Residents also help to fund their own recovery by working in a charitable business, which in Hexham includes furniture repair and gardening. I have visited several times and featured Betel in my book Doing Time. 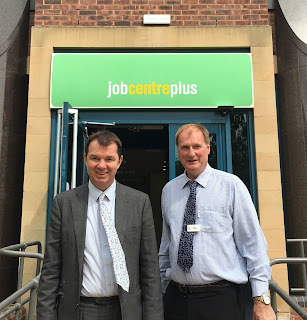 It was also inspiring to meet and listen to David and Brenda and to learn all about the work they are doing that is helping local people to recover and make a better life for themselves. I am a massive supporter of what they do. 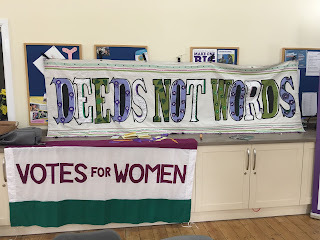 The very first National Democracy Week kicks off on Monday 2ndJuly 2018, marking the 90thanniversary of the 1928 Equal Franchise Act, which gave women the same voting rights as men. The aim of the week is to encourage democratic participation, with a particular emphasis on the fact that every single voice matters. There is still over a month to go until the event begins, however there are plenty of resources available to help you mark the week. 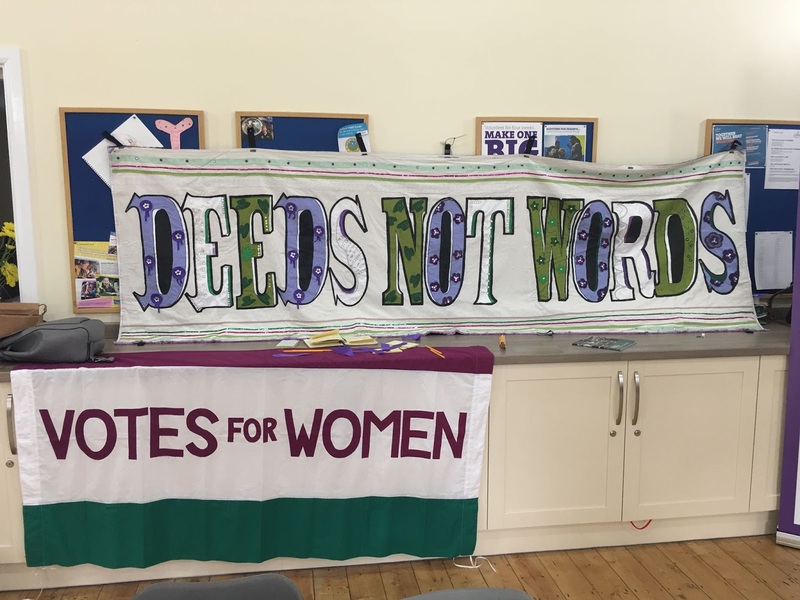 Whether you want to engage young people in our democracy or would like to hold or participate in a National Democracy Week event to celebrate progress and champion future democratic participation, the link below contains information, ideas and resources to help you get involved. I had a great day at the Northumberland County Show yesterday, where I judged and presented prizes to some of the brilliant stands on display. I really enjoyed looking around the stands, which showcased some of the best products Northumberland has to offer, and meeting the people behind our great local businesses and organisations. Everyone I spoke to was having a great day, and with so much to see and do, the Show made for the perfect bank holiday day out. It was a fantastic day with great weather- well done to everyone that helped organise it! 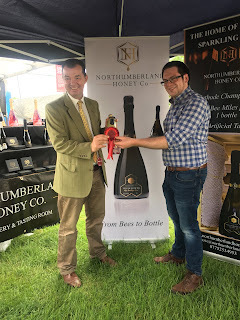 I am very proud to be able to welcome Northumberland County Council’s ‘Produced in Northumberland’ team to the Houses of Parliament next month, as part of an event to showcase the county and promote Northumberland’s food and drink sector, which is such an important part of our economic growth and prosperity. 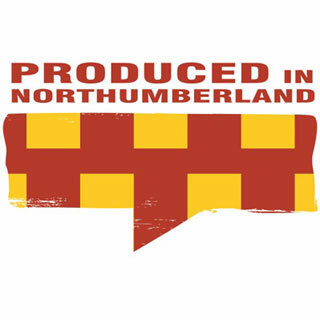 ‘Produced in Northumberland’ is a scheme which verifies that food and drink is produced in Northumberland, with audits carried out by Trading Standards and Environmental Health staff. The scheme is going from strength to strength, with around eighty businesses signed up and another forty interested or awaiting verification. 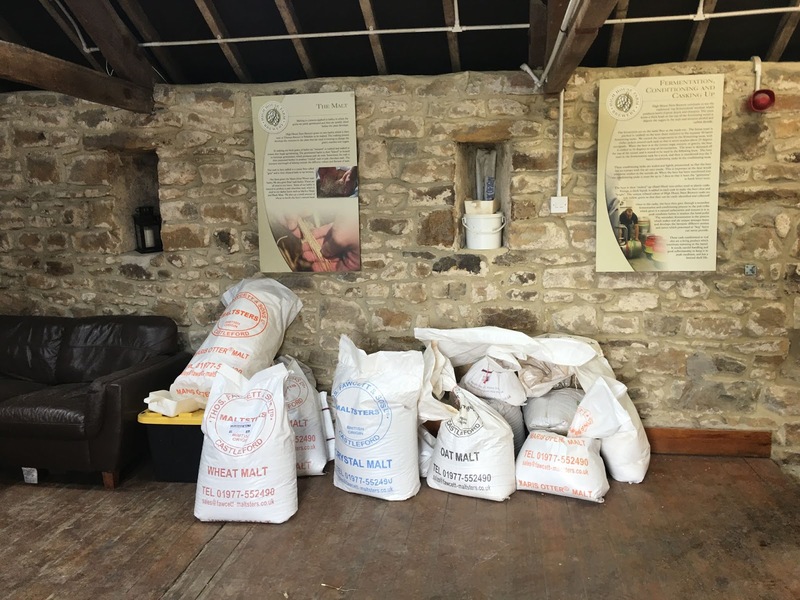 Businesses include the Artisan Bread Company, Brocksbushes Farm Shop, the Northumberland Cheese Company and the Northumberland Spirit Company. It is hoped that the scheme will raise the profile of Northumberland food and drink and therefore increase the local economy. 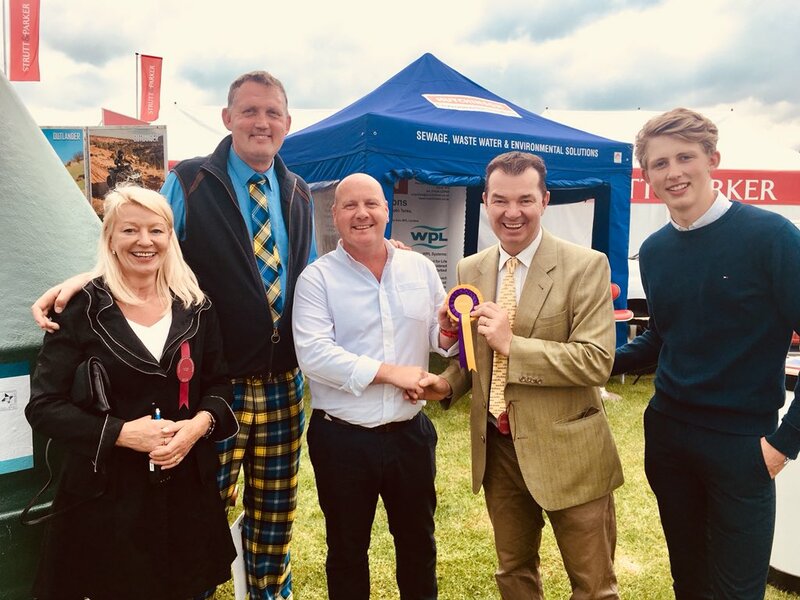 We all know about the fantastic quality of food and drink that is produced in Northumberland, and I look forward to next month and showing that food ‘Produced in Northumberland’ really is best. 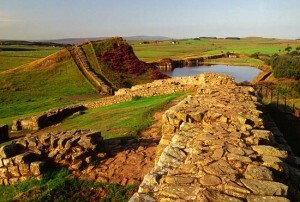 LOVE Northumberland - I do! 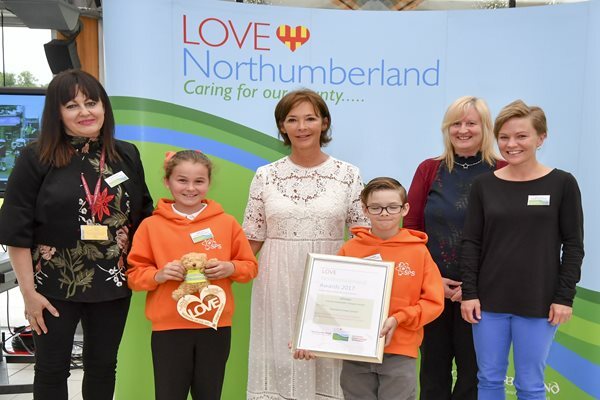 Entries are now open for the 2018 LOVE Northumberland Awards. Northumberland County Council’s scheme celebrates all that is great about community environmental work in the county. There is a variety of categories you can enter: best children’s project, best young people’s project, best urban project, best coast or countryside project, best new project, best school recycling project and outstanding individual. Cllr Glen Sanderson said: “We want to encourage people to get involved and make a difference in their area, and to celebrate all the fantastic voluntary effort that goes on up and down Northumberland each year, which supports the council’s aims to keep Northumberland clean and green”. Winners will be presented their awards by The Duchess of Northumberland at an event at The Alnwick Garden in July, and I would encourage you to get your entries in now. 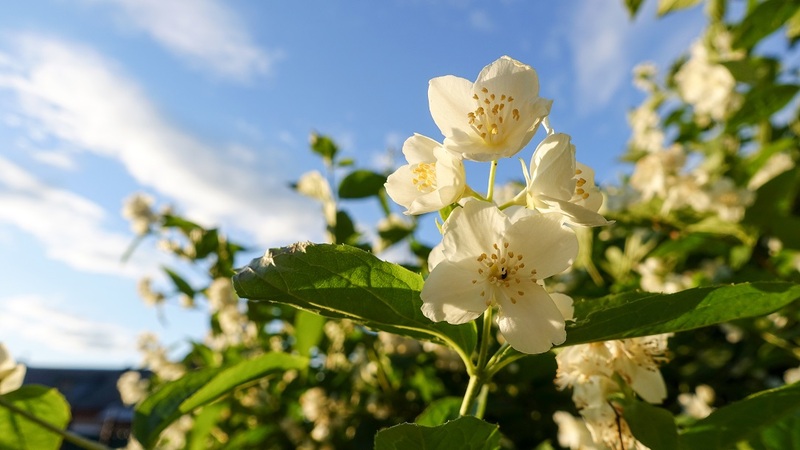 Tomorrow’s weather forecast looks promising, and what better way to make the most of the warm weather than a visit to Eachwick Hall, which is opening up its gardens tomorrow in aid of the British Red Cross. The gardens will be open from 2pm-5pm on Sunday 27thMay- entry is £4 for adults and free for children, and refreshments will be on offer. A great way to spend a sunny day, while raising money for a good cause as well. 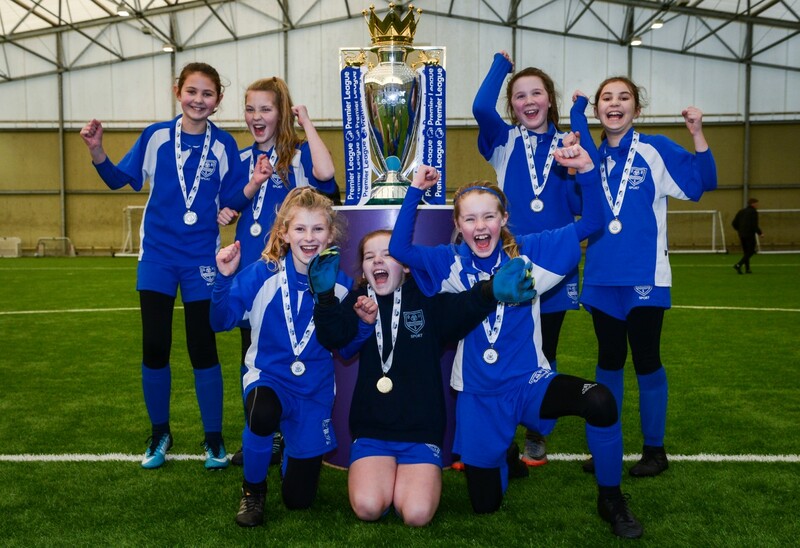 I would like to wish the best of luck to the Under 11 girls football team from Ovingham Middle School who are competing in the Premier League Primary Stars Football Tournament at Leicester City’s King Power Stadium today. 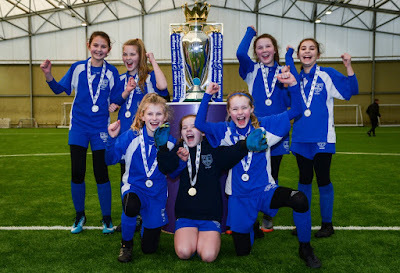 The team qualified to represent Newcastle United and will now get to enjoy the full Premier League experience, arriving in team coaches, using the team dressing rooms and playing on the pitch, officiated by Premier League referees. Good luck to the Ovingham Middle team- it sounds like it will be a very exciting day! After the incredible success of last year's event, work is well under way in preparation for my 2018 Jobs Fair. I recently visited the JobCentre to meet with Chris Howard to discuss plans for this year's event, which will take place later this year. It already promises to be even bigger and better than last year- I look forward to telling you more details about the event nearer the time. 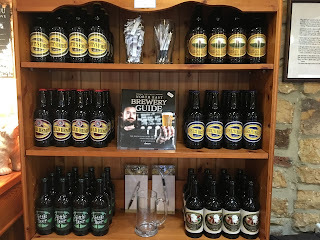 I recently visited High House Farm Brewery, a micro-brewery within a working farm in Matfen. The brewery is where all sixteen of their beers are brewed, made from the finest English ingredients. 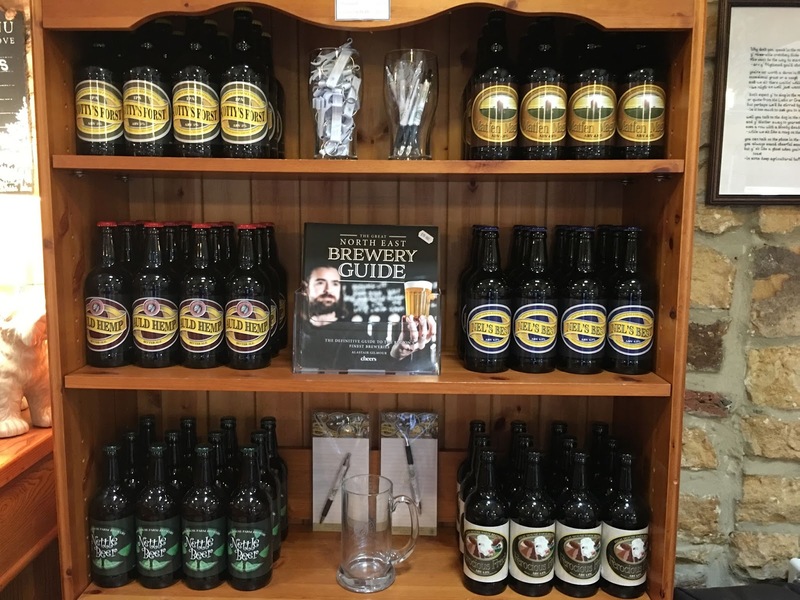 Their excellent beers have won several awards, including CAMRA Regional Awards, SIBA Regional and National Awards and a Bronze award in the Taste of North East England. 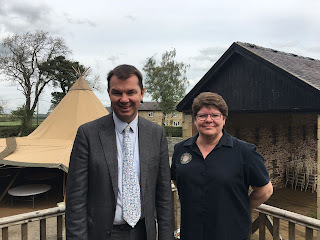 I really enjoyed meeting owner Heather and hearing all about the brewery and business, which will soon be expanding into the disused waiting rooms at Hexham Railway Station. High House Farm does tours of the brewery which I would certainly recommend if you would like to find out more about this great local brewery. It is also a fantastic wedding venue and a great place to stop for some food- yet another example of a great local business employing local people. The Allendale May Fair takes place next week, with events beginning on Friday 25thMay and taking place all weekend. The main event will be on Saturday 26thMay, 10am-4pm- there will be stalls, children’s activities, fair attractions, adventure and more. 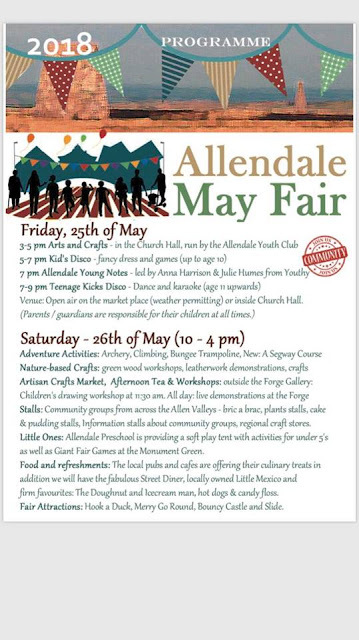 Allendale is certainly the place to be next weekend! 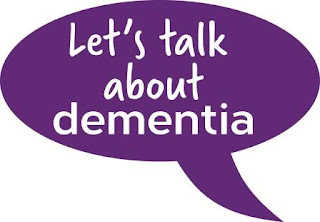 Next week is Dementia Awareness Week, running from 21st-27thMay. The week is dedicated to raising awareness and offering support to those suffering from dementia and their families, as well as pledging to create change in our communities. Dementia Awareness Week also highlights how people affected by dementia have the right to be treated equally and live the lives they want. 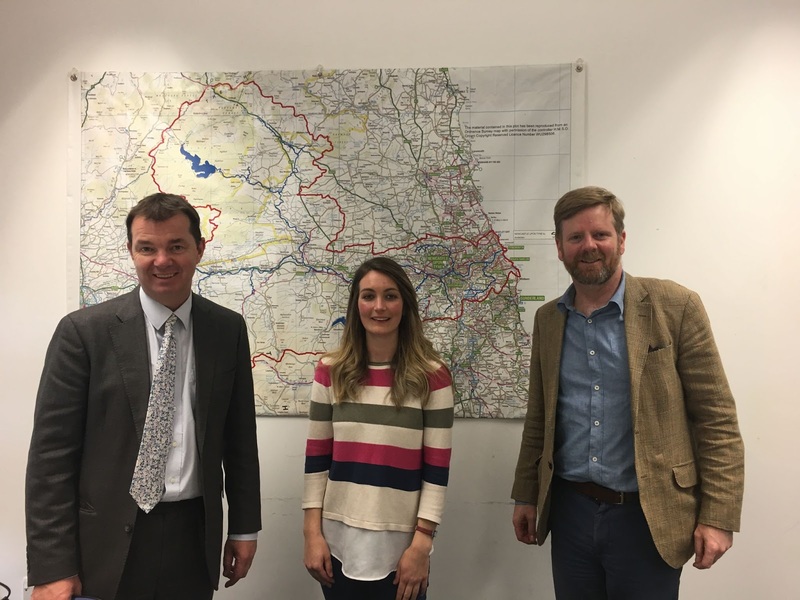 The Hexham constituency is leading the way on making our communities welcoming places for people with memory problems thanks to the Tynedale Dementia Alliance. Earlier this year was the official launch of Dementia Friendly Hexham, which aims to help local businesses to better meet the needs of customers with dementia, and the Adapt Cafe in Hexham is the home of the Hexham Memory Cafe. It is so important to ensure that dementia sufferers are able to remain and feel a part of the local community. I would encourage you to find out more about the Tynedale Dementia Alliance this Dementia Awareness Week and support the excellent work that they do. Solutions for the Planet- success for Corbridge Middle! 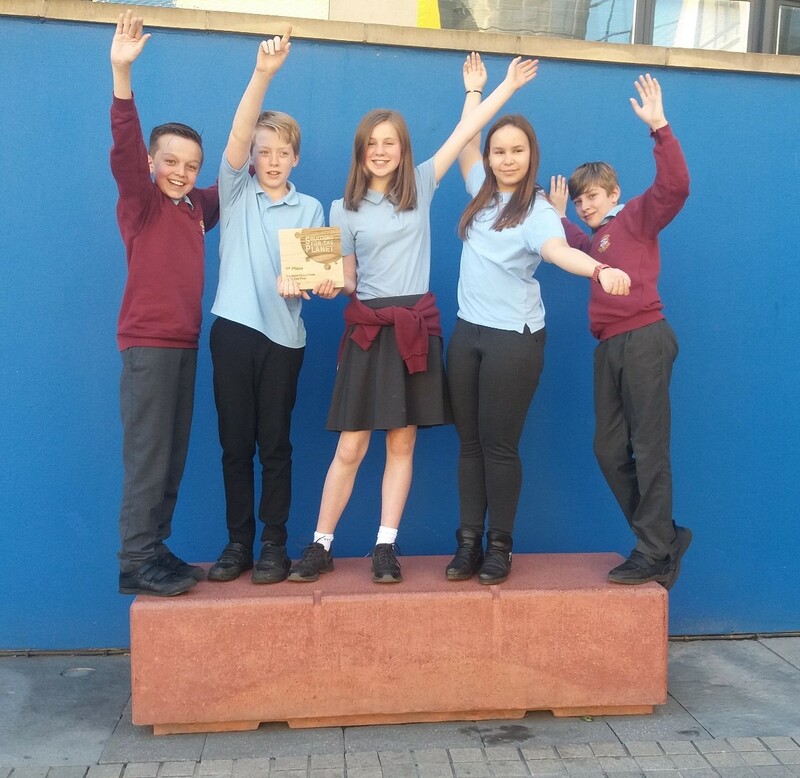 Earlier this week two teams of students from Corbridge Middle School took part in the regional final of the Solutions for the Planet Challenge. I am delighted to hear that one of the teams, Operation ReCraft, came first and will now go through to the national finals in the Houses of Parliament in July. 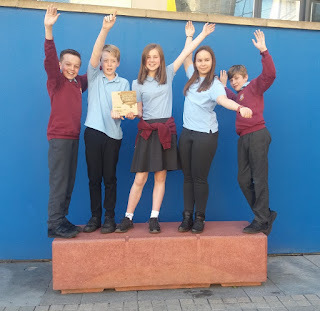 Their idea to run a sculpture competition in schools using waste materials impressed the judges, particularly as they had already run the competition in their own school to demonstrate that it is achievable. The team aims to promote an understanding of the damage waste can do in the environment and the idea that we should reduce the amount of materials going to landfill. It is always great to see young people that are passionate about saving our planet and the environment. Congratulations to Operation ReCraft and to all the students that took part in the competition. 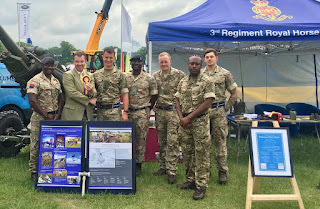 I wish Operation ReCraft the best of luck at the national finals in July. This weekend Cheeseburn Sculpture is holding its first open weekend of the year. On Saturday 19thand Sunday 20thMay from 11am-4pm, Cheeseburn will be opening its doors and showcasing its brilliant and thought-provoking sculptures. One of the installations will be ‘Plato’s Lair’ by Peter Hanmer, the winning piece of the second Gillian Dickinson North East Young Sculptor Awards. The piece is installed in the Walled Garden Potting Shed at Cheeseburn and features a series of miniature figures within a scene that has been specifically designed to immerse the viewer in the space. Cheeseburn is a great champion of sculptors and their talents- why not go along this weekend? This week (13th-19thMay) is Christian Aid Week, and I would like to take the opportunity to remind you of the work the charity does all year round to help improve the lives of people in the world’s poorest countries. For over seventy years, Christian Aid has been helping to change the lives of people of all faiths and none by tackling the root causes of poverty. A particular focus is on helping to build secure homes as hurricane season approaches and making sure that people get the help they need straight away if disasters happen. There is so much you can do to support the work of Christian Aid. One of the simplest is to donate to help build hurricane-proof homes that will last and help families to help weather storms this hurricane season. Events are also taking place throughout this week in support of charity, and I was pleased to attend a Christian Aid coffee morning last weekend. Please support in any way you can. I recently had a very constructive meeting with Danielle Anderson-Walker, Farms Liaison Officer at the Tyne Rivers Trust, and Corbridge Councillor Nick Oliver to discuss Natural Flood Management in the form of settlement ponds, leaky dams, tree planting and more. Anything that can be done to protect our towns and villages from the scale of flooding created by Storm Desmond in December 2015 is to be welcomed, and working together with our local farmers is one way of making a real difference. 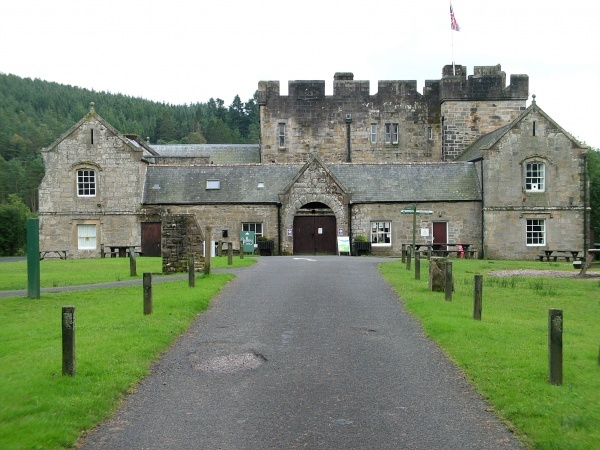 Kielder Vintage and Classic Vehicle Show- tomorrow! Northumberland County Show- mark your diaries now! 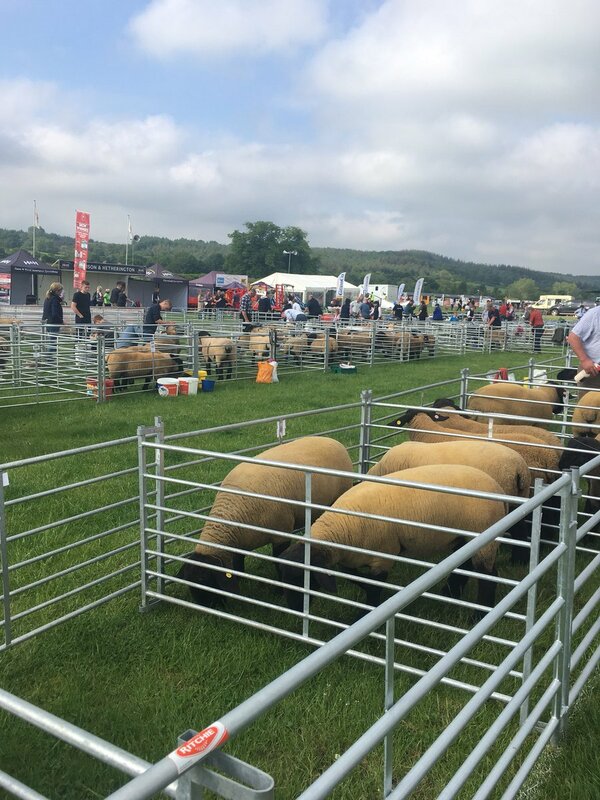 The last Bank Holiday might have just been, but you can already start planning ahead for the next one by marking your diaries with the Northumberland County Show. 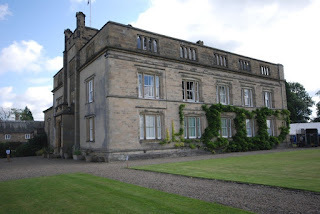 On Monday 28thMay from 9am-6pm, Bywell Hall near Stocksfield will be home to the always-fantastic annual show, which celebrates the best of Northumberland. 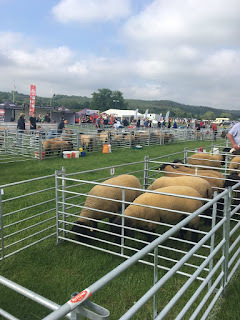 With animals including horses, cattle, sheep and dogs, as well as street food, art exhibitors, soft play and tractors, there is fun for all ages. Parking is free and you can beat the queues on the day by buying your E-ticket in advance online now. The last year has seen incredible success for the NewcastleCan initiative, set up by Hugh Fearnley-Whittingstall to tackle health and obesity by encouraging local communities to work together to get healthier. Now Prudhoe has joined the fight against obesity with Prudhoe Can RUN, a team to get Prudhoe running, whilst getting healthier, fitter and having fun at the same time. The group’s focus is on the Prudhoe Miners’ 10K Run on Sunday 23rdSeptember, and they want as many people as possible to get involved! 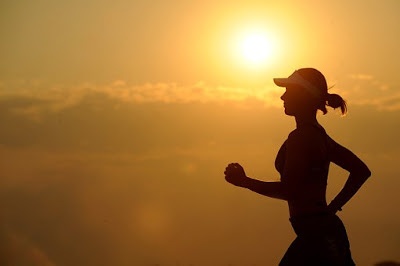 Even if you’ve never run before, Prudhoe Can RUN is a great way to motivate each other to get fitter and healthier. Making small changes to our lifestyle can make a huge difference, and I would certainly encourage everyone in Prudhoe to get involved and get healthier together. The Prudhoe Community Fair is on its way! 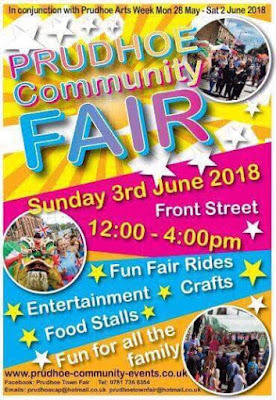 Mark your diaries because the Prudhoe Community Fair isn’t far away. Part of Prudhoe Arts Week, the Community Fair will be taking place on Sunday 3rdJune on Front Street from 12-4pm. With fun fair rides, food stalls, crafts and entertainment, it should be a great family day out. I will be keeping my fingers crossed for good weather! Northumberland Day 2018 - spreading the word to the rest of the country! 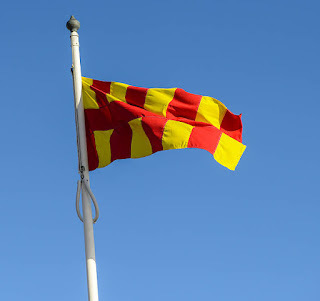 Northumberland Day is back after an incredibly successful launch last year. This year Northumberland Day 2018 will be taking place on Sunday 27thMay, as part of a great fortnight of events and celebrations. Events will be taking place all over the county, with so much already planned, to celebrate the past, present and future of Northumberland. 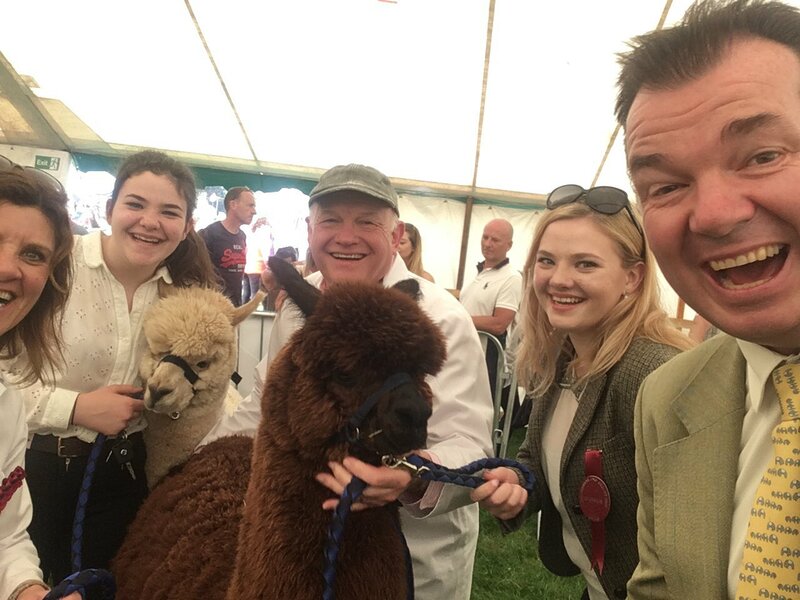 This year promises to be even bigger and better than last year, and I would encourage you to get involved and find out what’s going on near you as we celebrate Northumberland Day 2018. 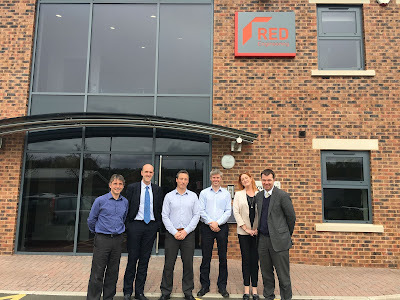 I recently visited RED Engineering in Hexham and met with Joe, Richard and Toby who took the time to tell me about the bespoke engineering solutions they provide to companies across Europe and in the USA. Founded in 2008, RED Engineering provides expertise and solutions to support the delivery of complex engineering projects. The company is based in Hexham and is employee-owned, with half of its staff chartered engineers. The Tyne Valley is home to a cluster of specialist engineering companies that are offering bespoke services to companies around the world and offering employment to highly skilled engineers. RED Engineering is a fantastic local company and I really enjoyed my visit. 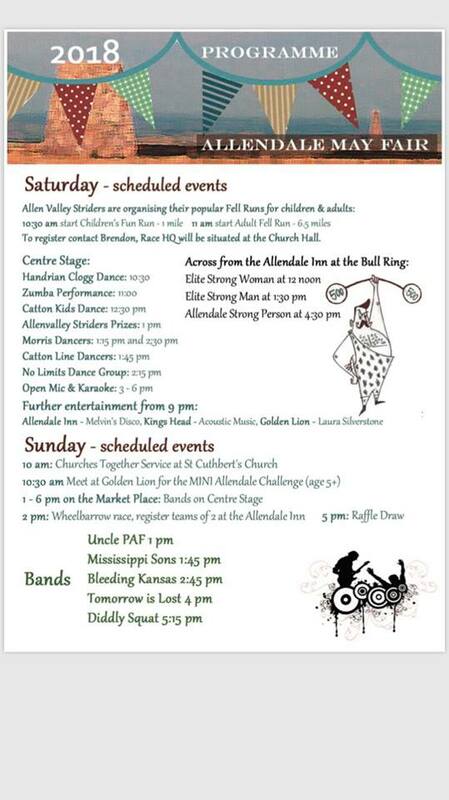 If you’re still looking for something to do this Bank Holiday weekend, there are plenty of exciting events taking place around the constituency to keep you and the family busy! Wildlife activities are taking place all over Kielder Water and Forest Park today and tomorrow as part of the Wild at Kielder Festival. With bird and red squirrel watching, the Kielder Castle craft fair and much more, this is a great way to make the most of the Bank Holiday weather. 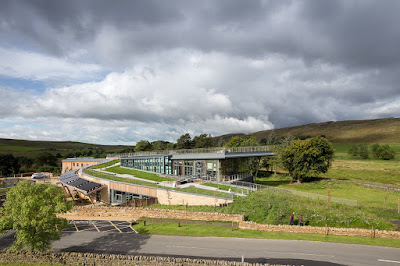 The Sill’s Spring Fair is on today, with traders from all over Northumberland selling crafts, cheese, beer and more, in what is a brilliant celebration of Northumberland. You can visit Corbridge Roman Town’s new museum, which is looking fantastic thanks to a grant from The Linbury Trust. With its incredible collection on display, including the Corbridge Hoard, it is definitely worth a visit. Whatever you do, enjoy your Bank Holiday weekend! I have been contacted by a number of constituents with understandable concerns about the announcement by Karbon Homes that it is to demolish Athol House in Ponteland as part of a major redevelopment scheme which will result in a new 32 unit, mixed tenure development of homes for over 55s. Obviously, news of this kind is very unsettling and unwelcome to the elderly people that call Athol House home, but I have been assured by Karbon that each and every resident will get all the assistance they need to find a new home where they feel comfortable and safe. Karbon will meet with every resident individually to determine their needs and to explain all the options available, and families and carers will be included in this process if the residents would like them to be. Jon McDonald, Support Housing Older Persons Manager at Karbon Homes, has made it very clear that they will give residents all the time that they need to find suitable alternative housing, and they will cover all reasonable costs associated with moving and pay a statutory Home Loss Payment to the residents. 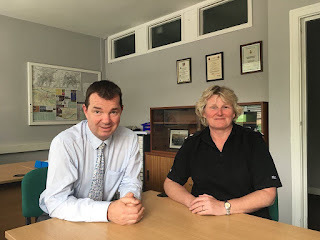 Karbon are also liaising closely with Ponteland Town Council and local County Councillor, Eileen Armstrong, to ensure that the best interests of the residents are looked after. The decision to demolish Athol House has been made because Karbon believe the current accommodation does not meet modern standards or the desire of older people to live in modern one or two bedroomed apartments or bungalows as opposed to bedsits. Once the new building is complete, residents will be able to apply for one of the new homes, assuming they meet the criteria for the building. Back in 2013 I was asked to open Trinity Court in Corbridge - a £2.1m replacement for a popular but outdated complex for the elderly that was demolished in 2010. Trinity Court was designed to keep residents’ living costs down, within easy walking distance of shops and leisure facilities, and I was hugely impressed with the quality of the accommodation on offer. 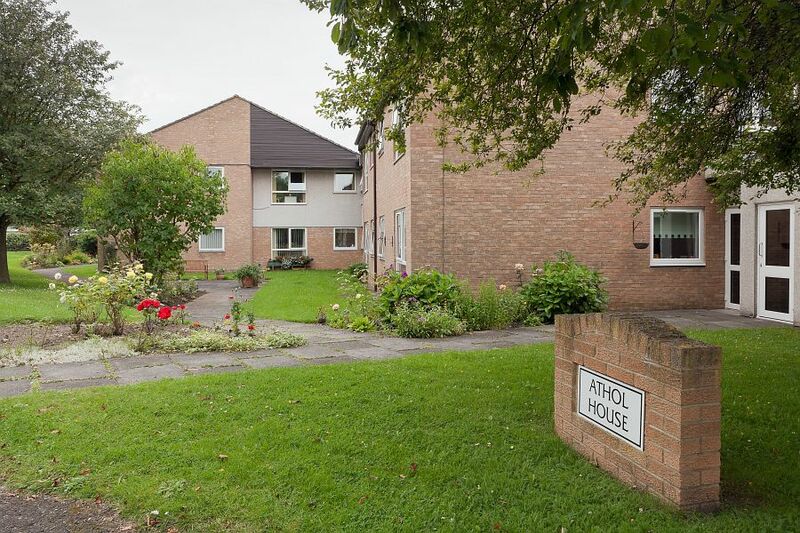 Experience gained from this closure and relocation will serve Karbon well as they work with the residents at Athol House to find new homes where they are happy and safe. I take the concerns that have been raised with me very seriously, and can understand how upsetting the need to move homes is for the residents - I will continue to do everything that I can to ensure that everyone affected is supported and helped to find a home that suits their individual needs and requirements. Touring Parliament- you can too! 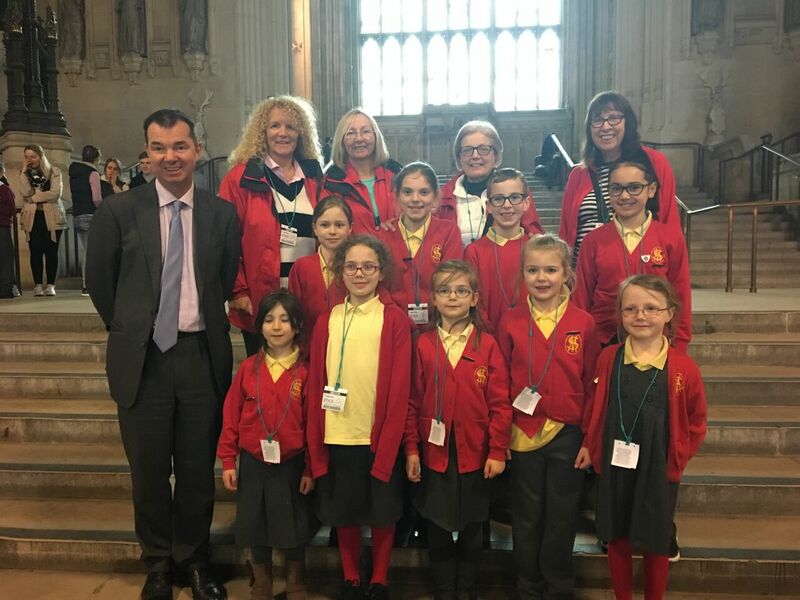 I was delighted to welcome staff and pupils from St Matthew’s Primary School in Prudhoe to Parliament recently, where they were given a tour of the building to learn all about how the Government works. Parliament is a fascinating building with so much history, and it was great to see the enthusiasm of the children about learning about our part. I really enjoyed meeting everyone from the school, and I really hope that they all enjoyed their visit. I am always happy to welcome local schools to Parliament and I would encourage schools to get in touch if they would like to arrange a visit. The Green Dog Walkers scheme has signed up its 1000th member. The scheme, which is supported by Northumberland County Council, is a community-led programme encouraging responsible dog ownership across the county. 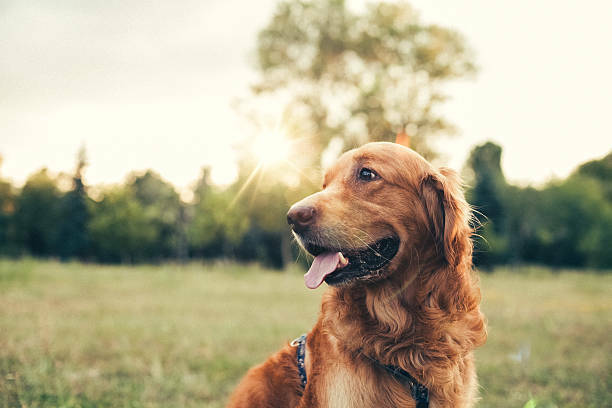 Dog owners can join by signing the Green Dog Walkers pledge, and are then sent a green dog walkers armband to wear when walking their dog to draw attention to the scheme. If you would like to get involved, the council is holding an event at Newbiggin on Saturday 12thMay from 11am-3pm, with a dog walk at noon. May is here- the month of the Royal Wedding as Prince Harry marries Meghan Markle- and Newton and Bywell WI are hosting a Cream Tea Day to celebrate the big day. 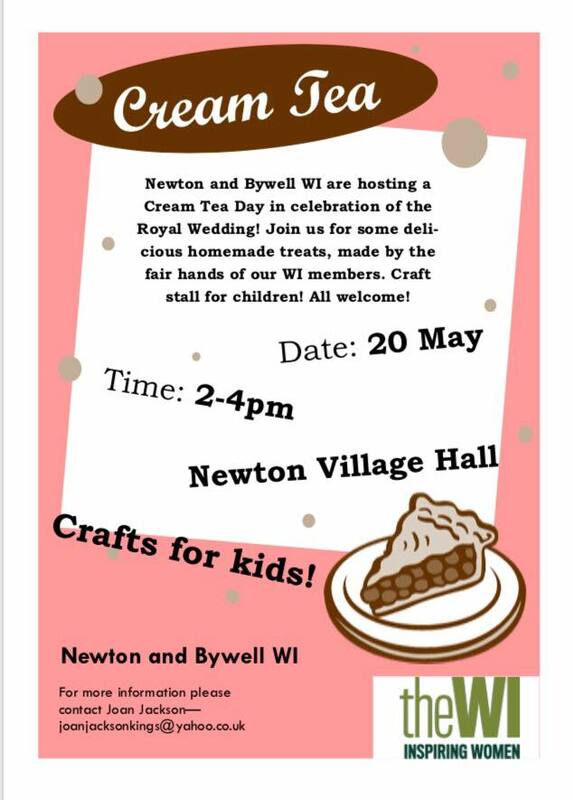 On 20th May at 2-4pm at Newton Village Hall, there will be plenty of delicious homemade treats made by WI members, as well as a craft stall for children. Everyone is welcome to attend and celebrate the royal event of the year! The Haltwhistle Spring Walking Festival is under way. From 28thApril-7thMay, there will be lots of interesting and scenic walks taking place, with both longer and shorter walks meaning there is something for every ability. The Festival takes place twice a year and this time around there are 24 guided walks, including four special interest walks with an expert on hand to share their expertise. Make sure to book ahead- more information is available on the website below- and enjoy a walk through our beautiful Northumberland scenery.